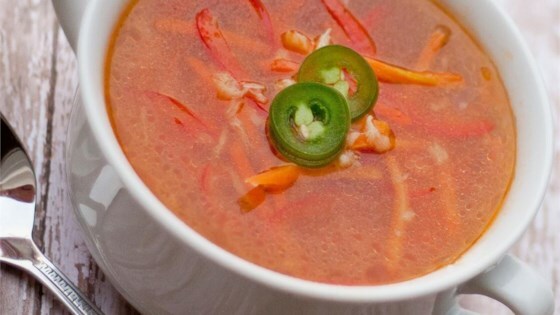 "This recipe for garlic soup was given to my Spanish class by the instructor, it's very yummy!" Heat oil in a large saucepan over medium heat. Stir in garlic and cook until lightly browned, about 5 minutes. Pour in 1 cup of chicken stock, cover, and allow to simmer until the garlic is soft, about 10 minutes. Mash the garlic with a fork into a coarse paste. Pour in remaining chicken stock, increase heat to medium-high, and bring to a boil. Stir in carrots and cook for 1 minute, then add red pepper and continue cooking until vegetables are tender. Season to taste with salt and pepper before serving. this is the most delicious soup. hard to imagine with so few ingredients doubled the garlic and peppers AMAZING! !